"Please know we loved Grandma Adamczak and considered her our own. She was a lovi"
"You were an angel to others on earth now you can enjoy being with all the angels"
Cecilia Adamczak, age 90, went to be with her Lord and Savior on Thursday, December 7, 2017. She was mother to nine children: Sam Blue, Alex Blue, Robert (Penny) Blue, Cecelia (Dale) Guenthardt, Laura (Jerry) Stefanski, Gerald (Mary Lou) Blue, Connie (Larry) Fenner, Harvey Adamczak, Drs. Donna (Peter) Rick. She was a Grandmother, Great Grandmother, and Great, Great Grandmother to over 50 grandchildren. She was a member of Good Shepherd Lutheran Church serving in the past on the altar guild, participating in the Women’s circles, and in the choir. She spent countless hours sewing, knitting, and crocheting gifts. She enjoyed dancing and playing cards. She loved and lived for her family. She taught generosity, always making room for one more, and sharing out of the little she had. She was preceded in death by her son, Sam. She is also survived by two siblings: Margaret Hagey and Alex Barron. Her funeral will take place at Good Shepherd Lutheran Church on Saturday, December 16th at 11 am with Rev. Kevin McClain officiating. Visitation will be held one hour prior to the service. Memorial contributions can be made to Good Shepherd Evangelical Church, Manistee, Michigan. 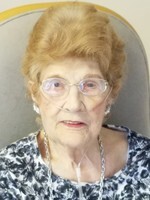 Visit Cecilia’s personal page of memories at www.oakgrovefh.com to share a story or photo. Arrangements by the Oak Grove Funeral Home & Cremation Center in Manistee. To send flowers to the family of Cecilia Mary Adamczak, please visit our Heartfelt Sympathies Store.